Tower Resources notes the announcement dated 7 February 2019 from Total regarding the results of the Brulpadda well, which has reported a significant gas condensate discovery in Block 11B/12B (Total 45% (Operator), Qatar Petroleum 25%, CNR International 20% and Main Street, South African consortium 10%) located in the Outeniqua basin, offshore South Africa. The well was drilled to a total depth of 3,633 metres and encountered 57 metres of net pay in Lower Cretaceous reservoirs, and with this discovery opens a new world class gas and oil play. Total have stated that they believe the new discovery could hold between 500 million to over one billion barrels of oil equivalent and they now intend to drill several further exploration wells on Block 11B/12B to test additional prospects. Block 11B/12B is located adjacent to the Algoa-Gamtoos licence, operated by 50% partner New Age Energy Algoa and held 50% by Tower. The Algoa-Gamtoos license also contains the southern deepwater basin margin of the Outeniqua Basin that was targeted by Total’s Brulpadda well and is approx. 150 kms along strike to the east from the Brulpadda discovery. Importantly, the Brulpadda well has successfully tested the Lower Cretaceous turbidite fan play of the Outeniqua basin slope, which is interpreted to extend along strike into the southern part of the Algoa-Gamtoos block, in which the Operator, New Age, has identified on 2D seismic a substantial prospect. 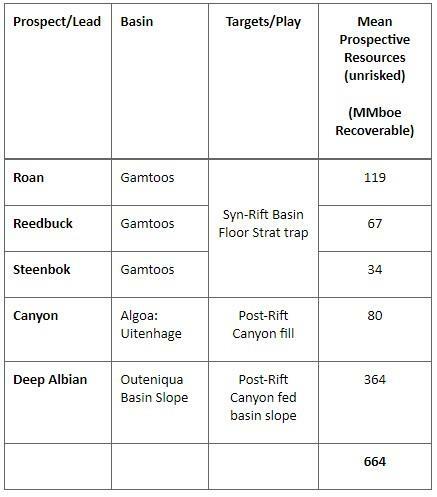 The Operator has assessed the analogue prospect potential on the Algoa-Gamtoos block at 364 million boe on an unrisked basis from 2D reprocessed data, which is an increase on its previous 2018 estimate. Envoi, on behalf of the Operator, New Age and Tower have been contracted to facilitate a farm-out of equity in the licence, and a data room is currently open. The updated (unaudited) prospective resources estimate, prepared to the SPE resource classification standard by the Operator for the five primary new prospects/leads identified during that process, is summarised on an unrisked volumetric basis in the table below. The Company will be updating the information regarding Algoa Gamtoos in its website shortly, including an updated regional map, to reflect this latest development.